A statue is being raised in a Scottish town honouring the man who led the development of Britain's "secret weapon" in World War Two - radar. Sir Robert Watson-Watt pioneered the technology that helped win the Battle of Britain, and was knighted for it in 1942 - but outside of his birthplace in Brechin, few people today remember his name. Radio detection and ranging, radar for short, is now used to keep passengers safe by detecting the flight path of every commercial aeroplane in the world, but it was developed as the threat of World War Two became more acute to warn of enemy planes on the move. During the conflict, radar arrays gave the Royal Air Force a crucial edge in detecting and repelling the Nazi Luftwaffe but the man who was honoured for their development has been oddly uncelebrated since. Watson-Watt, a descendant the celebrated engineer and inventor of the steam engine James Watt, was born in Brechin in Angus on 13 April 1892. His earliest work after graduating from University College, Dundee - then part of the University of St Andrews - was as a meteorologist, using radio waves to locate thunderstorms from his base at the Royal Aircraft Factory in Farnborough in Hampshire. Even then, in 1915, Watson-Watt was already using radio technology to provide advance warning to airmen. 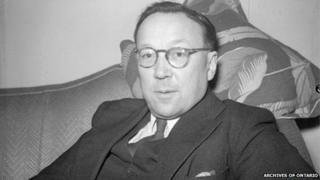 Twenty years later, working for the British Air Ministry - who had initially approached him about the feasibility of developing a "death ray" - he successfully bounced a radio wave from a BBC short-wave transmitter off a Heyford bomber, proving the radar detection technology could work. A small plaque at the site of that first test, near Daventry in Northamptonshire, is currently the only memorial to his work in Britain, despite what it would go on to achieve. And it has taken the Robert Watson-Watt Society in the town of his birth more than eight years to raise the funds to erect a statue to the man who may well have saved the country. Society chairman Stewart Hill said: "There's no memorial as such in the whole of Britain to the team that developed radar. "There's a small plaque where they did the exercise to detect a plane for the first time at Daventry, and that's it, as far as we know." In the closed-off world of pre-war secrecy, countries around the globe worked separately towards developing their own radar systems, but the most advanced work got under way when Watson-Watt was named superintendent of the Bawdsey Research Station in 1936, a year after his first successful test. It was there that his team developed radar towers and managed to properly track aircraft, first at short range and before long at distances of up to 100 miles. The team worked fast - as they had to, with the threat of what became World War Two rapidly approaching. By 1937 there were three full-scale radar stations on the south coast of England, and by the outbreak of the war there were 19. This technology was vital in providing early warning of Luftwaffe attacks, which could race across the Channel to strike at Britain in a matter of minutes. "It probably won the Battle of Britain," said Mr Hill. "Not many people know about it, but the fundamentals of radar were in place in 1938 - a tried-and-tested system was working before the Battle of Britain, and the Germans didn't know about it." While the Germans were aware of radar technology - it was a German, Christian Hulsmeyer, who patented the first primitive radar system in 1904 - they did not know about the Dowding System, the world's first large-scale air defence system, which had been built in Britain with radar detection at its heart. By linking up the stations Watson-Watt and his team stretched across the country - the "Chain Home" arrays - radar operators in the south of England were able to detect Nazi air attacks while they were still forming up over airfields in France. This meant advance warning could be sent out immediately to scramble RAF crews to intercept the surprised German pilots. Honouring this, the statue being raised in Brechin depicts Sir Robert holding a spitfire fighter aircraft in one hand, and a representation of a radar tower in the other. Midlothian-based sculptor Alan Herriot - who like Watson-Watt went to university in Dundee - said he had designed the statue with the pioneer's wartime achievements in mind. "It's basically a demonstration of the principles of interception," he said. "There were forms of radar out there already, but he developed the system to actually assimilate the information so you could identify planes and get the information off to the RAF bases around the country to get airborne and intercept the Luftwaffe. "I'm of the opinion that there's no question he won the Battle of Britain for us. "We would have been in trouble if the Luftwaffe had got through in any numbers - they were always amazed that the RAF were in the right place at the right time." Mr Watson-Watt became Sir Robert in 1942, when his work leading the radar team was made public. His team were awarded a hefty cash prize for their work after the war, which they decided to dedicate solely to Watson-Watt.